Hotel Galvez & Spa, A Wyndham Grand® Hotel, has been named a top choice in two popular magazines – Texas Monthly and ConventionSouth. Hotel Galvez was included as one of the “Where to Stay Now, Ten Best New (Or Improved) Texas Hotels” in the November issue of Texas Monthly. According to Texas Monthly, “the Queen of the Gulf still radiates the same splendor that made the landmark building the center of Galveston’s social life in its heyday.” Writer Jordan Breal complimented The Spa as well as the restaurant, pool and complimentary bicycles. Other hotels included Hotel ZaZa in Houston, Rancho Loma in Talpa, Riven Rock in Comfort, The Joule in Dallas, El Cosmico in Marfa, Hotel Saint Cecilia in Austin, The Inn at Dos Brisas in Washington, JW Marriott San Antonio Hill Country Resort and Spa, and Travaasa Austin. ConventionSouth, a national multimedia resource for planning events in the South, recently presented Hotel Galvez with a 2012 Reader’s Choice Award. “The value in receiving this prestigious recognition is that it comes from the United States’ top meeting professionals who book events in the South,” said ConventionSouth Publisher J. Talty O’Connor. “These planners demined the highest level of customer service and quality facilities and they have contributed in determining that Hotel Galvez indeed displays the commitment to professionalism, creativity and service that they require.” This is the second year that Hotel Galvez has received this award. Hotel Galvez & Spa, A Wyndham Grand® Hotel and National Trust Historic Hotel of America, is the only historic beachfront hotel on the Texas Gulf Coast. This 224-room, 101-year-old hotel offers 13,000 square feet of meeting space, a 9,763-square-foot spa, fitness center, full-service restaurant, lobby bar and pool with a swim-up bar. 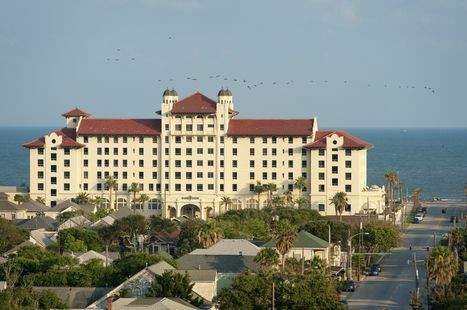 The hotel is rated four diamonds by AAA and is owned by Galveston preservationist George Mitchell as part of Mitchell Historic Properties. For reservations, call (800) WYNDHAM or visit www.WyndhamHotelGalvez.com. Hotel Galvez offers a view of the Gulf of Mexico or a view of Galveston.